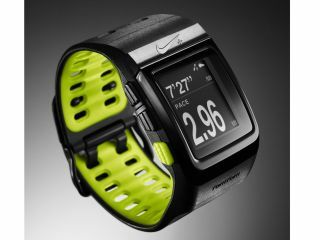 Nike and TomTom have announced a new partnership to take the sporting firm's running prowess up a notch with the new Nike+ SportWatch GPS. Powered by TomTom, the new running watch offers touch sensitive controls and GPS reception as well as connecting to a Nike+ shoe sensor and heart rate monitor. The result is a more accurate way for runners to track their data, see their speeds and challenge previous records, as well as easy importing to Nikeplus.com to share the results with other running-type people. Each run will be graphically mapped using the TomTom technology, and includes route notes, elevation and length. Runners will also be able to spot new routes by searching the catalogue by location, length, difficulty, and even landmarks. You're the best, around, nothing's ever going to keep you down! In a slightly scary way, the watch will offer audible cues ('Attaboys', which fills us with fear) for personal records, run reminders and 'post-run encouragement', which we assume is designed to kick in should tears and screaming be sensed. A USB connection allows easy synchronisation to the automatically started Nike+ Connect interface, which will then send the data to the online portal. If you're looking to get into shape after the Christmas bulge, the Nike+ SportWatch GPS won't help you, as it's not due to land in the UK until 1 April. We're still searching for a UK price, so will let you know when one pops its head above the penny-parapet.